Want to add some romance to your life? This classic belly button ring is the perfect romantic accessory. 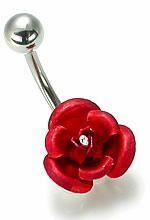 It has a rose that comes in a variety of colors as the bottom ball on a stainless steel shaft. This belly button ring will add style to any outfit.